Northern Basement Systems provides expert concrete repair solutions using the PolyLevel® system. PolyLevel® is an expanding polyurethane foam that is injected beneath the concrete to fill the gaps caused by soil erosion and raise and stabilize the concrete surface. If you have sunken concrete surfaces you need repair, call us today at 1-855-248-5226 or contact us online to get started with a free estimate! We provide residential and commerical concrete leveling services in Burlington, Keene, Colchester and the nearby areas. Ready to see why PolyLevel® is the superior choice for concrete leveling? Northern Basement Systems can provide you with expert concrete lifting and leveling services for all types of residential and commercial purposes. 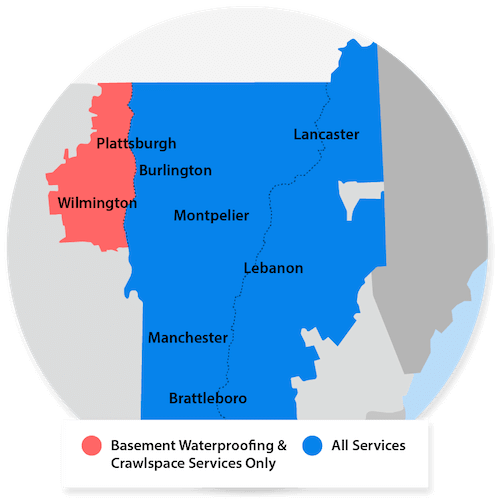 Call us today at 1-855-248-5226 or contact us online to get started with a free estimate in Burlington, Keene, Colchester, Rutland, Laconia, South Burlington, Bennington, Brattleboro, St Albans, Montpelier and the surrounding areas.